of wood. A profound sense of aesthetics. A birthplace of vivid colors. A cozy corner for visual enjoyment. hiding place. A piece of paradise. Ever wondered if there is a villa that just stands out from a cliche? At first sight, Green Frame might look just like an ordinary holiday villa, but when you start digging deeper it is clear that you’ve run into something special! Enjoy a playful synergy of Mediterranean stone, hard wood and sharp modern furniture lines - all combined with a profound sense of style and aesthetics. The walls of the villa are packed with Mirna Sišul art - vivid colors are warming up every inch of the cozy interior full of natural daylight. 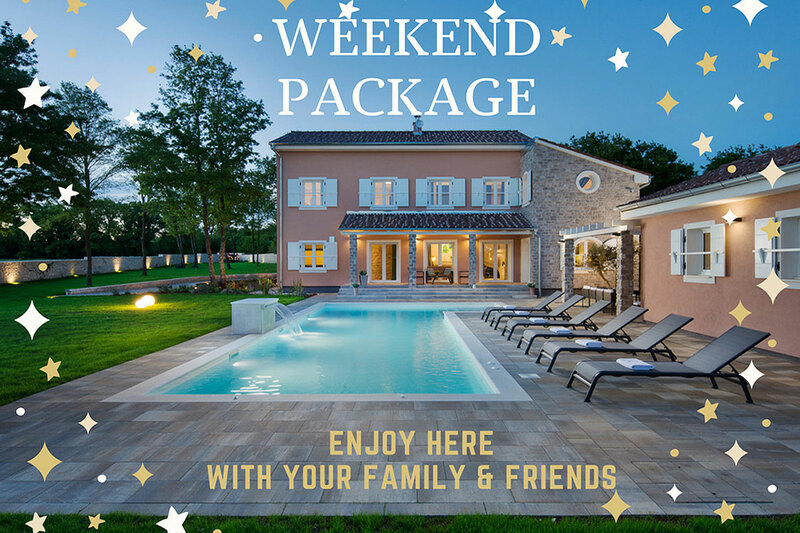 Spacious enough to comfortably host up to 10+2 people, this beauty offers one of the best experiences one can find in the south Istrian hinterland. Green Frame Villa even has a sweet spot for the real headonists and wine lovers - a beautifully furnished and well equipped wine cellar, right next to the open terrace with a dining area and a pool view. For spring, autmn and winter wellness experience here are indoor hot tub and finish sauna sa well as sport appliances and equipment. Special offer valid until 22.12.2018. 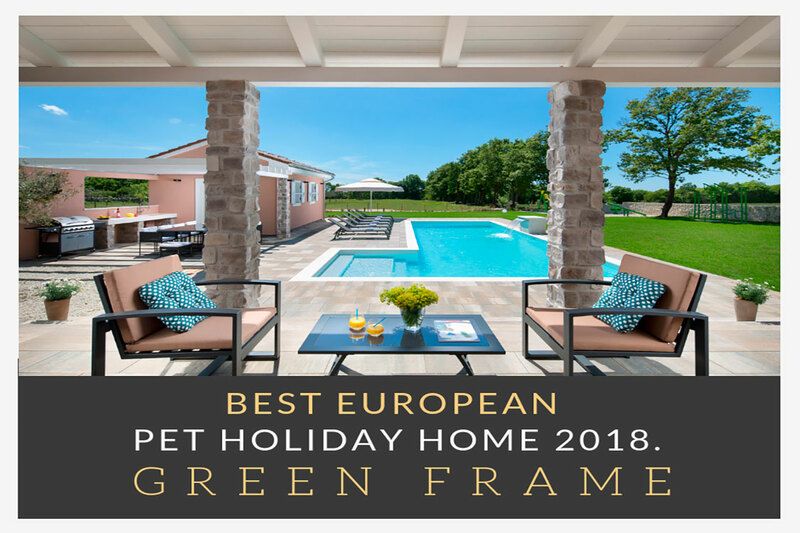 So proud to announce that Green Frame villa is the BEST EUROPEAN pet holiday home for 2018. Villa “Green Frame” is located in a small village Klarići, near Svetvinčenat town in Istria, only 15 km from the largest Istrian city of Pula, 10 km from Pula Airport, 10 km from Brijuni archipelago and the seaside, with less than half an hour drive to all popular locations within the Istrian peninsula. The property is located in a secluded but quite popular location for the accommodation of wealthy guests seeking intimacy and a getaway from neighbors, disturbances or crowd. The total area of the property is 4200 m2 and the landscaped part of the property is approximately 2500 m2. The property is largely fenced in a stone wall that surrounds the beauty of the Istrian autochthonous estate, giving it discretion and security. Lat n 45 0' 25,5"
Lng e 13 53' 8,9"
Check availability and contact us to book your perfect holiday right away! SEASON 2018 07.07. - 24.08. 30.06. - 06.07. 25.08. - 31.08. 16.06. - 29.06. 01.09. - 07.09. 19.05. - 15.06. 08.09. - 14.09. 08.01. - 18.05.